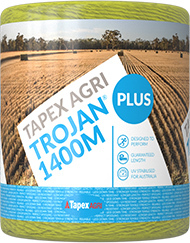 For more time on the windrow and less time loading spools, Trojan® Plus large square twine is a baling contractors dream come true. With 27% more twine per spool that regular Trojan® you’ll get an extra 360 bales per pallet before you need to stop and re-load. Excellent tensile strength & knot performace. Low friction characteristics to reduce wear on baler parts.